In a course he taught at Harvard Business School and elsewhere for many years, esteemed psychiatrist Robert Coles asked future money market managers and risk arbitrageurs to pause for a semester and reflect on the ethical dimensions of their chosen profession. Now, for corporate professionals, armchair entrepreneurs, and other students of commerce, Coles has gathered a generous and stimulating collection of classic literary reflections on the ethical and spiritual predicaments of the business world. 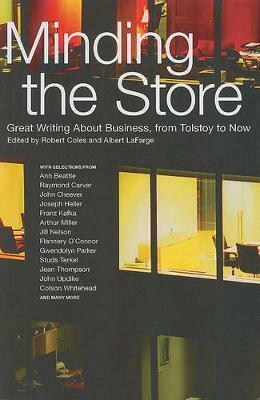 From John Cheever's descriptions of a businessman who endures a moral crisis after stealing a neighbor's wallet, and Gwendolyn Parker's "Uppity Buppie," in which an African American woman ascends to the upper ranks of corporate America, to Death of a Salesman and Tolstoy's "Master and Man,"Minding the Store offers a richly human vision of the business world. With selections by Joseph Heller, Flannery O'Connor, Ann Beattie, and John Updike, Coles gives us the essential literary gems that illuminate the human predicaments of commerce and the moral quandaries of the marketplace. Robert Coles is a psychiatrist and writer. Until recently, he was the James Agee Professor of Social Ethics at Harvard University. He is a co-editor, with Randy Testa, of A Life in Medicine: A Literary Anthology and Growing Up Poor: A Literary Anthology; a co-editor, with Albert LaFarge, of Minding the Store: Great Writing About Business, from Tolstoy to Now; and the author of Lives We Carry with Us: Profiles of Moral Courage, edited by David D. Cooper, all published by The New Press. His many books also include The Moral Intelligence of Children and Bruce Springsteen's America: The People Listening, a Poet Singing. Coles received a Pulitzer Prize in 1973 for his acclaimed five-volume Children of Crisis series, a MacArthur Award in 1981, the Presidential Medal of Freedom in 1998, and the National Humanities Medal in 2001. He lives in Concord, Massachusetts. Albert LaFarge, PhD, founded the Albert LaFarge Literary Agency in 2003. He was deputy editor of DoubleTake magazine, working alongside Robert Coles, MD, with whom he co-edited Minding the Store: Great Writing About Business, from Tolstoy to Now (The New Press). LaFarge is the editor of The Essential William H. Whyte; has contributed articles to American Way, Commonwealth, and the New York Times; and has been interviewed on CNN. He has taught writing and editing at Harvard College and Boston University and since 2012 has been a visiting lecturer in liberal arts at the Massachusetts College of Art and Design.